Drama. 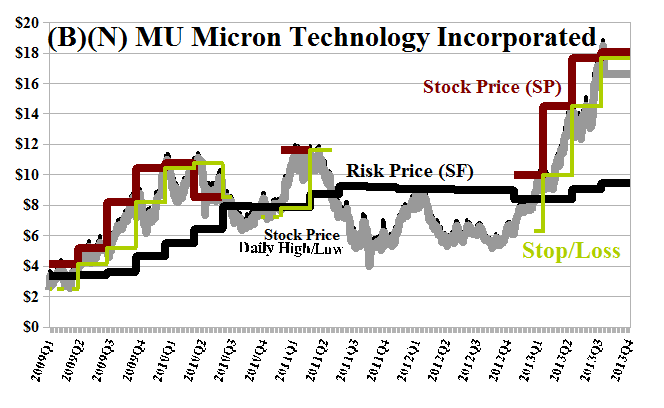 Analysts are offering us a “chip dip” on the semiconductor company Micron Technology. The Street is positive and so are others such as Bernstein Research and Jefferies & Company but Wells Fargo analysts have suggested that the company will “underperform” the market and they have a price target range from $14 to $17 for a possible 20% decline from the current $17 to $18 whereas the “positive” analysts have reasons to expect a +50% gain to between $25 and $30 (The Street, October 14, 2013, Analysts Reiterate Positive Outlook For Micron Technology (MU)). From our point of view, the decision is quite simple else we would be confused and wonder why nobody told us to buy it for $6 two years ago or whether it would be a mistake not to buy it today for $17. Our reason for buying it and holding it at these “high” prices is that Micron has been in the Perpetual Bond™ since much lower prices of $10 early this year and it’s still well above the price of risk at $10 to $11 and rising. Please see Exhibit 1 below. On the other hand, the company doesn’t pay a dividend and our estimate of the downside in the stock price is minus ($3.50) per share so that it could be trading between the current $17 and $14 to $21 without surprise. But the market is full of surprises! In this case, as is often the case with rapidly rising stock prices, the stock is 50% owned by a dozen institutions most of whom have $500 million to $1 billion positions in the stock and some sold and took profits on Friday – knocking about $1.50 off the stock price – while others bought. For example, the PE ratio is a mere 16× which suggests a 6% yield on an ownership position that’s not a “bad” purchase when we have hundreds of millions to spend and good company to do it with. The “Risk Price Chart” (Exhibit 1 below) also shows our stop/loss prices but we also note that the November put at $16 is available to us for $0.30 per share today which, at less than 2% of the stock price and which we can pay for by selling just two shares to protect the price on a hundred, is not a bad insurance in case the company that we keep decides to abandon us without notice. We think that it’s also evident that no amount of “fundamental analysis” will help us to make a decision like that (sympatico Mr. Fama). Indeed, Micron was “cheap” at $6 but we couldn’t buy it because it was trading below the price of risk and had investors who did buy it at $6 known that the price of risk was $10, they might have held on to it (in January) rather than take profits. For more information, please see our Post, The RiskWerk Company Glossary. Micron Technology Incorporated is a global manufacturer and marketer of DRAM, NAND Flash memory, CMOS image sensors and other semiconductor components. It has two segments, Memory and Imaging. From the Company: Micron Technology Incorporated together with its subsidiaries, engages in manufacturing and marketing semiconductor devices worldwide. Its products for data storage and retrieval comprise dynamic random access memory (DRAM) products, including DDR2 and DDR3 for use as main system memory in computers and servers; and other specialty DRAM memory products, such as DDR and DDR2 mobile low power DRAM, DDR, SDRAM, reduced latency DRAM, and pseudo-static RAM used in laptop computers, tablets, and other consumer devices. The company also offers NAND flash memory products, including RealSSD solid-state drives, flash memory cards, CompactFlash and memory stick products, SD memory cards, and JumpDrive products used in mobile phones, MP3/4 players, computers, solid-state drives, tablets, digital still cameras, and other personal and consumer applications. In addition, it resells flash memory products that are purchased from other NAND flash suppliers. Further, Micron Technology, Inc. provides NOR flash memory products that are electrically re-writeable, non-volatile semiconductor memory devices used in consumer electronics, industrial, wired and wireless communications, computing, and automotive applications; and manufactures semiconductor components for CMOS image sensors and other semiconductor products. It markets its products to original equipment manufacturers and retailers through its internal sales force, independent sales representatives, and distributors, as well as through a Web-based customer direct sales channel, and channel and distribution partners. The company was founded in 1978, has 20,000 employees and is headquartered in Boise, Idaho.